The Dertig Facility, near the larger city of Hammanskraal, is up and running! Manager Nkosi Ndebele is working on fine-tuning our filter recipe to produce the optimal flow rates in the filters. The Dertig Facility has become a community fixture and many people from the area are excited to be involved in filter production as well as tending to the garden that was planted last year. We continue to work with our community partner Khulisa Social Solutions and are looking to grow our sales in the next year. Khulisa Social Solutions, a South African NGO which addresses social vulnerabilities and helps build up grass-root projects, is PureMadi’s community partner in this second facility. Khulisa has worked on various projects which emphasize poverty alleviation, crime reduction, victim empowerment, enterprise development and community support. Over the course of a year, Khulisa project manager Zain Halle and PureMadi President Rebecca Kelly negotiated and entered into a Memorandum of Understanding for the two organizations to work under as they develop the second facility. Khulisa plans to initiate marketing efforts in the Hammanskraal area once the facility is closer to completion. In the summer of 2014, Board Member Jim Smith along with Officers Rebecca Kelly, Theresa Hackett, and Sydney Schrider selected a site location for the second facility in the North West province in the city of Dertig. Permission to build a facility from the Tribal Offices of Hammanskraal was obtained and a land survey was conducted. Rebecca, Theresa and Sydney were also able to meet with two future filter facility employees, Grace and Paulina. Grace and Paulina continue to be enthusiastic about the project and have high hopes for what it will bring to the community. In the summer of 2015 a UVA Jefferson Public Citizens team comprised of Matthew Smith, Alice Burgess, Max Barab and Anna Wallace spent a month in Hammanskraal. They helped to initiate and oversee the start of construction the filter facility as well as further develop community ties. Grace and Paulina were at the facility every day and got family and friends of theirs excited about the project as well. Construction is being done by a local company as well volunteers in the community who are very much committed to the project. One of our future employee’s husbands has big plans for the entrance of the facility – he has begun planting lemon and orange trees, even a vegetable garden. On one side of the facility there is an elementary school and on the other a church is being built so we anticipate a lot of great educational opportunities with these two neighbors. Meet Nkosinobubelo Ndebele (Nkosi for short)! She is a native of Bulawayo, Zimbabwe. She graduated as valedictorian from the National University of Science and Technology in Zimbabwe in 2014 with a degree in Environmental Science and Health, motivated by the lack of both clean water and support for environmental issues back in Bulawayo. 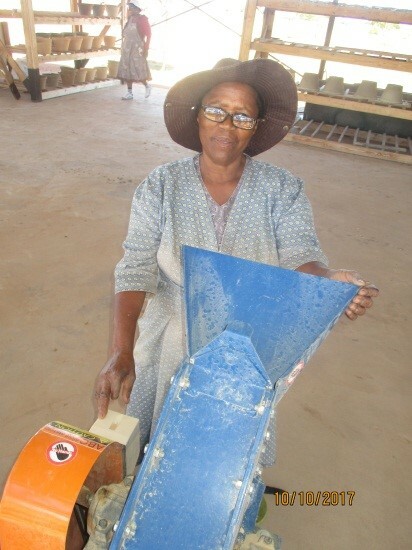 Nkosi came to PureMadi after completing a one-year internship for a Bulawayo-based NGO called Dabane Trust where she learned about water purification technology with a focus on sand abstraction systems. She believes that PureMadi’s silver nanoparticle filtration method is a particularly effective and sustainable solution to making clean water more accessible to developing communities and is excited about its potential to mitigate the spread of waterborne illness across South Africa. In the next few years, she hopes to be inspired by PureMadi’s methodologies and eventually go back to school for a Master’s Degree in Environmental Engineering to create her own new technology which will help the global effort to improve access to clean water. 33 year old Abiot, has two children. Abiot, who also works as the security guard enjoys exercising and going to the gym. He loves animals and watching the National Geographic television channel. Abbey also enjoys working with young children, as he has worked at a nursery school before. He loves working at the Dertig Filter Facility because of the different personalities and ideas that all PureMadi staff have. 68 years of age, Grace has 4 children and 12 grandchildren and 1 great grandchild. She loves sweet foods and enjoys spending time with her family. Grace wishes to see PureMadi expanding to other provinces of South Africa as it is an initiative of creating employment and reducing poverty in disadvantaged communities. Born and bred in Dertig, the 64 year old Jennifer enjoys gardening. She has 2 children and 5 grandchildren. Jennifer has worked at the Babelegi Industrial Site before and she enjoys working at the Dertig filter facility because of the unity that the staff has. Jennifer enjoys cracking jokes and laughing. Lydia is the eldest of all PureMadi Dertig staff. Everyone calls her Koko Manoni (Koko means Granny in Tswana and Manoni is her 2nd name). She is 82 years of age and has 1 son and 4 grandchildren. She is the eldest surviving member in her family hence her family relies on her and always asks her for advice on different aspects of life. Koko Manoni enjoys eating pap and beef. She loves working at the Dertig filter facility because to her, it is a form of exercise to keep her fit. 72 year old Margaret has 4 children, 7 grandchildren and 3 great grandchildren. She loves going to church and is a good gospel singer. Margaret stays alone so working at the Dertig filter facility and meeting other women keeps her occupied and reduces her loneliness. 46 year old Micheck is affectionately known as Stlaks (because he was a good soccer player in High School). He has two children who he loves unconditionally. Stlaks is a follower of political news and loves listening to Pop and Soul music. He enjoys working at the Dertig filter facility because he gets to learn new things every day. Paulina is a 75 year old woman who now has 1 surviving son (out of 5 children). She has 5 grandchildren and 5 great grandchildren. Paulina's favorite person in the world is her husband Mr Zacharia Kau. She loves him because he was her first boyfriend and they have since grown old together. Paulina loves reading the Bible and also loves people. She has worked voluntarily in assisting the elderly who are no longer able to bath themselves and do other basics. Paulina loves her job and has been an invaluable member of staff. Piet (38) and Delina (32) have been married for 5 years and have two children together. These two do everything together and are best friends. Piet loves Delina because she takes good care of him and their two kids and also respects him so much. Delina adores Piet because he always prioritizes their family. Piet loves reading about current affairs, reading magazines and watching television whilst his quiet wife enjoys doing all household chores. These two enjoy working at the Dertig facility because they love working with their hands and the PureMadi working environment is so refreshing for them. The ever smiling Sinah is 52 years of age, has 4 children and 2 grandsons. Sinah is a confident straight talker who is friendly and has a very bubbly character. She enjoys baking and cooking. Sinah enjoys making water filters because the ceramic filter technology is new to her and she is still fascinated about the whole filter making process. Sinah wishes a bright future for her children and has always taught them that education is the key to success! Your generous donation can help families and schools in South Africa have access to clean water.